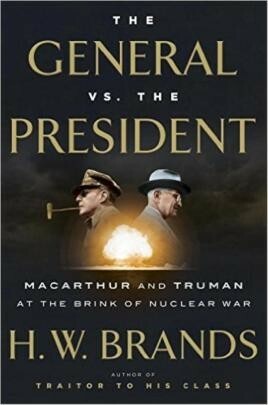 From master storyteller and historian H. W. Brands, twice a finalist for the Pulitzer Prize, comes the riveting story of how President Harry Truman and General Douglas MacArthur squared off to decide America's future in the post-World War II order. Unfortunately, due to sales rights restrictions, we cannot offer The General vs. the President for sale in your country. At the height of the Korean War, President Harry S. Truman committed a gaffe that sent shockwaves around the world. When asked by a reporter about the possible use of atomic weapons in response to China's entry into the war, Truman replied testily, "The military commander in the field will have charge of the use of the weapons, as he always has.” This suggested that General Douglas MacArthur, the willful, fearless, and highly decorated commander of the American and UN forces, had his finger on the nuclear trigger. A correction quickly followed, but the damage was done; two visions for America's path forward were clearly in opposition, and one man would have to make way. Truman was one of the most unpopular presidents in American history. Heir to an economy struggling off its war footing, a ruined Europe, and increasing tension with the Soviet Union, on no issue was the path ahead clear and easy. General MacArthur, by contrast, was incredibly popular, as untouchable as any officer has ever been in America. The lessons he drew from World War II were absolute: appeasement leads to disaster, and a showdown with the communists was inevitable—the sooner the better. In the nuclear era, when the Soviets, too, had the bomb, the specter of a catastrophic third World War lurked menacingly close on the horizon. …a fine analysis of the complex interrelationships between MacArthur, the Joint Chiefs of Staff, the President, his political rivals and the US Press. This is incredible, thrilling stuff - how it panned out that MacArthur didn't run for president is, to me, something of a mystery. An absolutely enthralling slice of modern history!